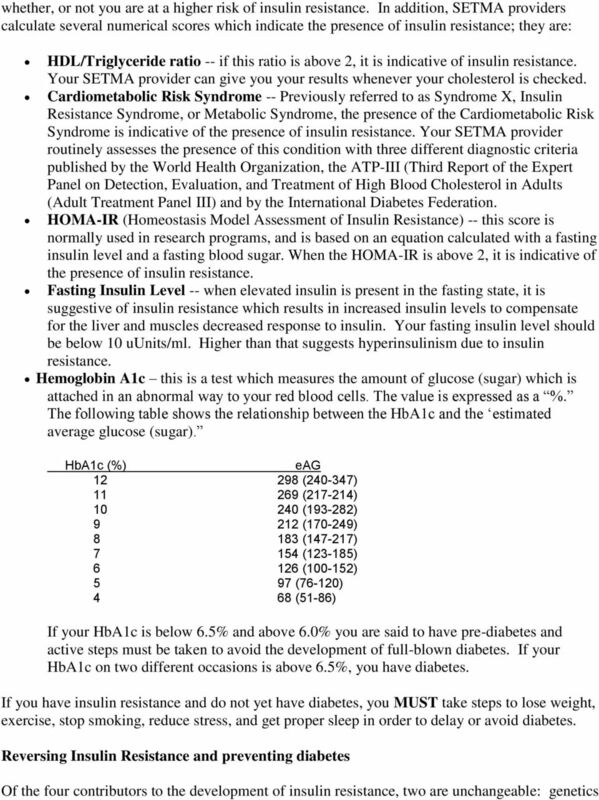 Download "Prevention of and the Screening for Diabetes Part I Insulin Resistance By James L. Holly, MD Your Life Your Health The Examiner January 19, 2012"
5 blood pressure levels. Stop Smoking In addition to increasing your risk of cancer and cardiovascular disease, smoking contributes to insulin resistance. Quitting smoking is not easy, but it could be the single smartest thing you can do to improve your health. You will reduce your risk for respiratory problems, lung cancer, and diabetes. Be Active and Eat Well Physical activity helps your muscle cells use blood glucose because they need it for energy. Exercise makes those cells more sensitive to insulin. 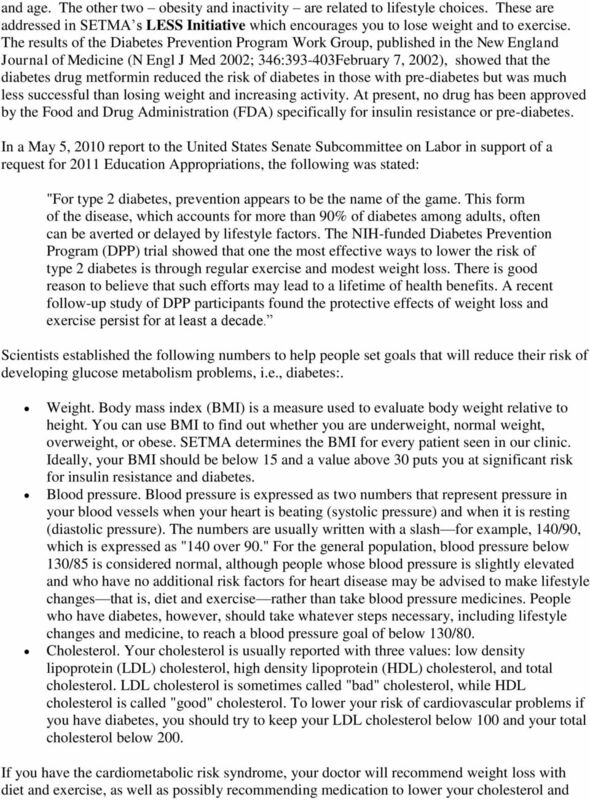 The Diabetes Prevention Program (DPP) confirmed that people who follow a low-fat, lowcalorie diet and who increase activities such as walking briskly or riding a bike for 30 minutes, five times a week, have a far smaller risk of developing diabetes than people who do not exercise regularly. The DPP also reinforced the importance of a low-calorie, low-fat diet. Following a low-calorie, low-fat diet can provide two benefits. If you are overweight, one benefit is that limiting your calorie and fat intake can help you lose weight. DPP participants who lost weight were far less likely to develop diabetes than others in the study who remained at an unhealthy weight. Increasing your activity and following a low-calorie, low-fat diet can also improve your blood pressure and cholesterol levels and has many other health benefits. 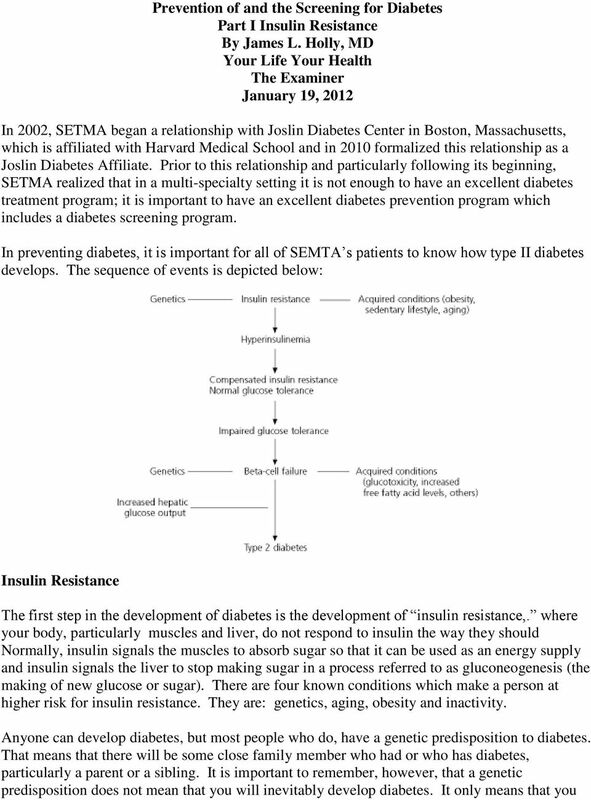 Before the pancreatic Beta cells, which produce insulin, fail, producing type 2 diabetes, they are put under stress by the increasing demand for more insulin produced by insulin resistance. 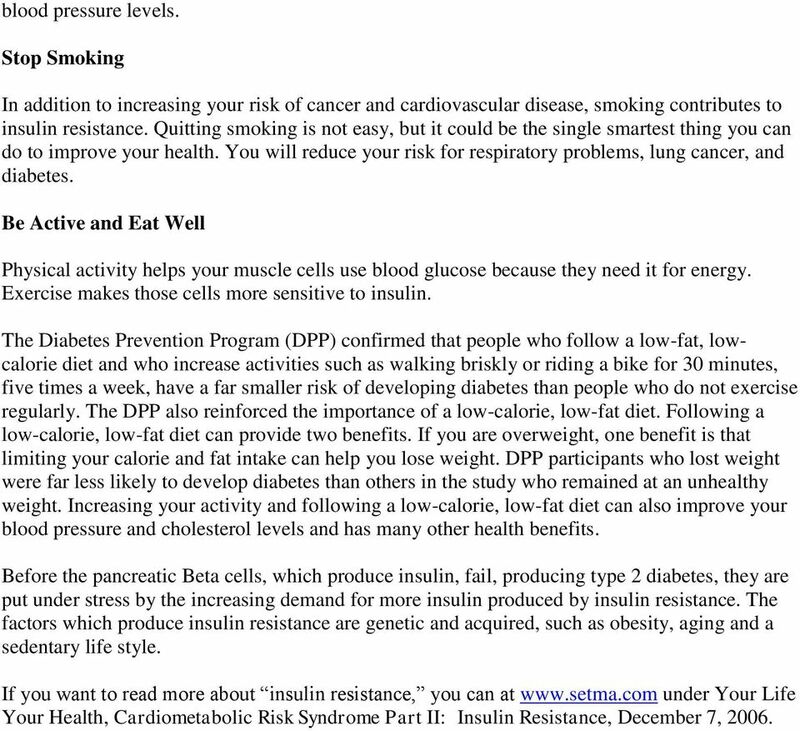 The factors which produce insulin resistance are genetic and acquired, such as obesity, aging and a sedentary life style. 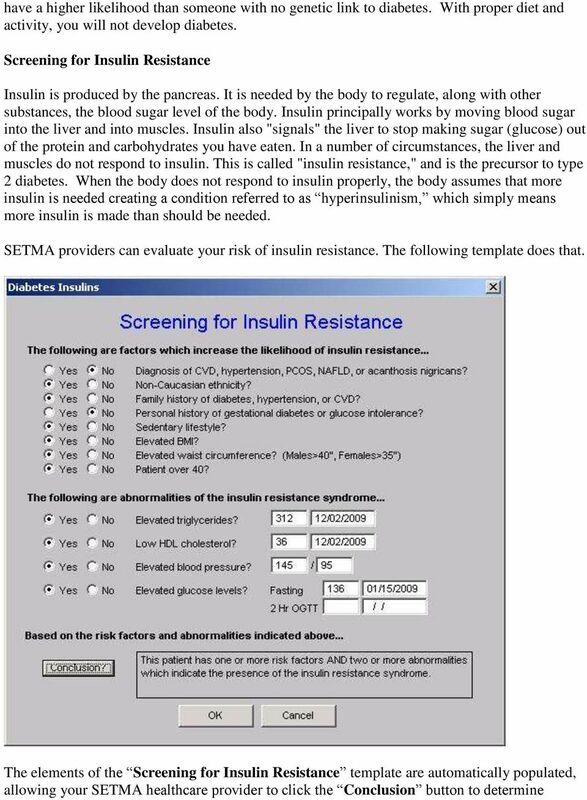 If you want to read more about insulin resistance, you can at under Your Life Your Health, Cardiometabolic Risk Syndrome Part II: Insulin Resistance, December 7, 2006. WHAT DOES DYSMETABOLIC SYNDROME MEAN? Freiburg Study. The other 24 subjects had healthy markers closer to what would be considered ideal. METABOLIC SYNDROME AN INTEGRATIVE APPROACH AN OPPORTUNITY FOR PHARMACISTS TO MAKE A DIFFERENCE Mike Rizo, Pharm D, MBA, ABAAHP THE EVOLUTION OF THE PHARMACIST 1920s 1960s 2000s THE PHARMACIST OF THE FUTURE? Why have new standards been developed? Menopause. Weight Loss. A Special Report on Weight Gain During Menopause. contact us. FROM THE DESK OF: Carolyn J. Cederquist, M.D. Dr.